Travel back in time to discover the innumerable treasures of an ancient civilization. Click here to play! 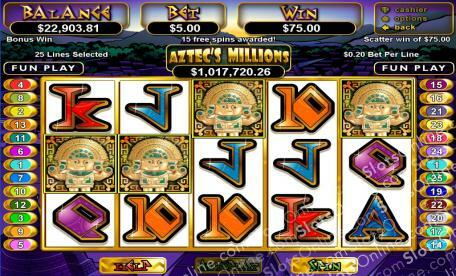 If you're successful in this adventure you could return home with the Aztec's Millions! It's key to keep your eye out for the Aztec King in this game. He only appears on selected reels, but he will substitute for all other symbols except scatters. There are plenty of other symbols to help you out in your search for Aztec gold in the jungles of central Mexico. Spin one or more Aztec maidens and you could multiply your line bet up to 5000 times. Jaguars and Aztec gods will also help you out as each will pay out if you can spin two to five across a pay line. Don't forget about the golden jewels. Spin three to five of these valuable items and you'll get up to 500 times your line bet. Be sure to watch out for the scattered idol. Spin three to five of these little golden statues and you'll multiply your total bet up to 100 times. That's not all, three or more anywhere on the board could get you 25 free games in which prizes are tripled! The real secret to this game though is the Aztec's Millions symbol. If you spin five of these on a pay line, you'll win the Aztec's Millions. Literally. So roam the ancient Aztec civilization for a chance to bring home a golden fortune! The Aztec golden idol acts as a scatter. Three or more anywhere on the board will multiply your total bet. It will also trigger 25 free games in which all prizes are tripled. The Aztec King acts as a substitute symbol. He only appears on reels 2, 3 and 4 and will substitute for all other symbols (except scatters) to create more winning combinations.